Read articles written by very well-known personalities and eminent authors about Gandhian view on Education and it's relevance today. When I start mentioning of a 'school of nonviolence' everyone jumps to a conclusion that we are going to start a regular, four walled, formal school with fixed syllabus, exams, ranks and uniforms etc. But I wonder whether the meaning of nonviolence will go in tune with the system of education we have now. That has to be discussed later. But for the present let me put it this way. A school of nonviolence is not a regular school but merely a school of thought. Educating not only the children but the whole lot of people not only in India but of the whole world in a culture of peace and nonviolence will be the aim of the school. One may ask, has not this education been carried on in the past? Yes. Adi Shankara. Ramanuja, Madhawa, Mahaveer, Jesus Christ, Prophet Mohammed, Guru Nanak, Lord Buddha and others like them were great teachers of this school of nonviolence.Since ages past, the methodology has changed from time to time. The same old wine in new bottles. That is why the talk of the new millennium in spite of the fact that the sun has never changed its path. Gandhiji has been a great teacher of this peace education with non-violence as the central focus. Has he taught an abstract subject? No. 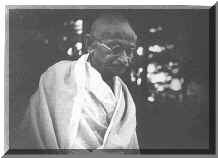 Day in and day out, in every one of his actions, he experimented and experienced the relevance of nonviolence and communicated the results to his fellow humans. His life style becomes a school for anyone to get educated in nonviolence and peace. The 'School of nonviolence' of my vision will have three implications. The Chinese writer Lin Yutang has written a book named "The Importance of Understanding". I think most of the violence occurs due to a lack of understanding of men arid matters. If we analyse violence in a family or in an office or for that matter in a nation governed centrally, the violence may be from one person with power who might not have understood this ameobiotic stomach.I would rather put the dictum "War begins in the mind" as against “War beings in the stomachs". If stomach can condition our brain, our last resort is our heart. Vinobaji used to tell people who get irritated about the social evils that their irritation should not enter into the brain which may lead to disastrous activities but instead enter into the heart which may Iead to constructive change. I will say, all the atrocities carried on in the past or now for example, the killing of the religious saints, the killing of Mahatma Gandhi or the recent killing of the Christian priest Rev. Stains or the injustice done to the nun result due to the disorder in the brain. The same people to whichever religion they may belong to condemn these barbarous acts. Did I say 'barbarous'? I should say inhuman acts which any human on this earth should protest against. Natural calamities like the earthquakes, whirlwinds. floods etc. warn the people on the earth that they should as soon as possible break the barriers oft heir images of different identities, may it be religious, racial, caste and the like, and come together without hatred in the bottom of their hearts for the simple reason that when natural calamities happen they harm everyone irrespective of their identities. I wish to mention here that Gandhi linked the earthquake in Bihar to the sin of unsociability we practiced. Should not one understand life in its fullness, holistically? Here comes the need for the school of nonviolence. In our 'Youth for Peace' projects in schools, interaction with the school students reveal that they are merely the revised edition of the school of thought that prevails on that particular day, repeating whatever system of thought is brought out through their parents, newspapers or friends. This type of warping one's own self in a particular school of thought enables clever people to make lobbies for their own products or ideas. The only way to get out of this habit of being influenced is to find out one's own truth. Thousands of youth are being brain washed into certain ideas like nationalism and patriotism with an interpretation of hating the neighbor countries and think of the thousands also influenced into sacrifice during the freedom movement. Are both the same? No. The former school of thought becomes successful with one’s tendency to copy the prominent idea of the moment whereas the latter depends upon one’s seeking truth within. So one has to understand one's own body, psyche, relationship between the body and mind, the functioning of life’s system and the role one has to play in bringing peace and harmony in life. That is what. I would call the school of non-violence. Secondly, the aspect of appreciation. It need not be dealt with separately, because wherever there is real understanding, there is appreciation. But I would give great emphasis to this aspect of appreciation because when people fail to form the right understanding, they are fooled even without an awareness of their being fools, they go on appreciating the follies. So if they fail in the first step, let them be stopped at least in the second step. With that aim. let me elaborate what I mean by appreciation. Life is full of diversities. They cannot be understood in their full from unless you have the sense of appreciating them. Wonder becomes a wonder only if appreciated at least within oneself. I will elaborate it with an example. Do our children appreciate the present education system? Or do our teachers or at least the Vice-Chancellors? None appreciate it. I heard in one meeting a Vice-Chancellor confessing to the audience that he has been instrumental in producing thousands of “mentally retarded" students from the educational institutions under his control: But where to stop? A few days back we conducted the 'Youth for Peace" programme for the Vlth std. students. They were sitting in chairs in a hall. I made a suggestion that they could sit together on the floor. Immediately they pushed away the chairs and sat on the floor. I wanted to ask them whether they can remove their shoes. Certainly they would welcome it. I did not want to disturb the school routine very much. But we should realise that the students are always under certain pressure either from the school authority or from their parents. Under pressure one cannot have tile freedom to be educated i.e. to learn to observe, wonder, share and be joyful. And is there a motive for education? Of course...One has to face life’s challenges in the right way. A boy of 20 came to our office seeking a job. His hair was not combed. He was not neat and tidy. I gave him oil soap and comb and asked him to freshen himself. He did. After half an hour of work, he said he had stomach pain and returned home. Two days later he came again, with uncombed hair. Again he was helped for combing, washing etc. He seemed not to have eaten. When enquired it was found to be correct. I gave money and asked him to eat in the nearest hotel. He left in the evening and came back after two days, of course with his hair uncombed. I lost my patience but before I started shouting at him he started telling the painful incidents that happened in his house. Father quarreled, beat his mother and mother became unconscious. He did first aid and reached the office. His sister studying in the XI std. stopped going to school from that day.And he told that this quarrel was going on since many years as far back as his memory goes. His father is a government employee earning a handsome salary. A few years ago, I was watching TV with my son. In the news, the parliamentary session was being shown. Our politicians were throwing mikes and chairs on one another. After seeing the behaviour of the aged people in our parliament,my son with a sad face asked me 'why papa, is our country like this?’ I didn't answer him but his sad face ever since haunts me. The house as well as the nation are in the same condition. Challenges like the above have to be met with in the right way by our youth. Does our present education help them in this regard'? Lessons taught are completely unrelated to the present but promise future prosperity, the system of inculcating skills is unconnected to gaining wisdom, trying to convert humans into robots.... finally ends in a business transaction of mutual exploitation. Just for show, one or two classes for value education or moral education or leadership training etc. are taken. We are cheating ourselves. The one and only aim of education must be to enable them to appreciate - appreciate one's own qualities and at the same time appreciate the qualities in others, if the Chief Ministers of all the states were taught to appreciate the beauty of the rivers, the beauty of the rice and wheat crops, they will spontaneously realise the importance of linking the rivers and provide water for the needy states. I see people becoming crazy by taking up minor issues like a quarrel in a village being politicised and taken to the notice of the President of India by a petition or telegram! Appreciation starts with people revering life in its totality. Finally, the third point. I would call it action-reaction factor. Nowadays there is no action at all but only 'reaction.' As science and technology develops, everyone tries to lead a life not on one's own but as a response to the development around. One of my friends is conducting a driving school. He does not need a cell phone. But he has one. When asked, he replied "when the cell-phone is in the market how can I live without it?" His "minimum needs" include a cell phone. I hope I am making myself clear by saying that we are all "reactionaries" or in the words of J. Krishnamurti, we are all second-hand human beings. We are all victims of the consumeristic pattern of life and already we are in chains. Will a second freedom movement free us? Even the revolutions for the upliftment of the poor are planned as a reaction, comparing the life-styles of haves and have-nots. All such experiments end up in violence. Any comparison, competition results in reaction that would obviously end up in violence. I happened to be in my native village when the incident occurred. That day dawned with one of the youth in the village committing suicide. The reason? On Christmas Eve, a few youths drank and danced on the roadside where the local political party flag poles were planted. In a drunken state they pushed each other on the poles and so one of the pole’s broke. In the morning the respective 'disciples' of the political party caught hold of the youths, garlanded them with chappals, beat them and like dogs drove them throughout the streets of the village compelling them to shout a slogan pleading for pardon. Shameful! That night one of the punished youth’s committed suicide. This is what I learnt form the villagers. What was the result? Youths belonging to other parties, other castes and religions joined hands and carried the body and put it across tile main road, blocking traffic. Since that is the only road connecting the towns which are 25 km apart, traffic stopped completely. Those vehicles which tried to pass through were destroyed by the youths. It went on for hours. Around mid-day RDO came and tried to pacify the crowd on behalf of the collector. It did not help. At last the collector of that district came and assured proper action would be taken against the culprits. A part of the crowd did not yield and demanded immediate action. But the collector did not yield and there was a lathi charge. The crowd at last melted. Are the acts of the youth and the police, actions or reactions? Another experience: In one of our sessions in a school, during a three hour programme for the VI Std. children, we were completely exhausted by the naughty behaviour of the children. Most of them did not allow us to say what we wanted to say. Yelling, jumping, quarreling with each other. But we were patient telling them stories, mono acting etc. Suddenly there was pin drop silence when a lady teacher entered the class room with a stick in her hand. Is the teacher's act action or reaction? I would call them as reactions in both cases. Reactions always lead to violence and destruction. So what is action? I would explain it with the Satyagraha launched by Gandhiji. He said that Satyagraha is conceived from his inner voice. The inner voice coming out of his relative truth. Of course it is also a reaction in response to an action already happened but out of one's own realization of 'truth within' which makes it a complete action leading to peace and harmony. So the purpose of the school of non-violence should enable one to act but trot to react. The best example can be given from Gandhiji's Satyagraha movement. Satyagraha when interpreted might have taken different implications. But according to Gandhiji, Satyagraha means "sticking stubbornly to one's own truth of the moment." Whatever one realises as truth for the moment must be put into action, even risking one's life. This can only be possible with the former two steps i.e., understanding and appreciation of the situation. To educate people in these three aspects necessary for "action" Gandhiji gave very relevant programmes which can even now be followed by everyone. For getting the right understanding, Gandhiji evolved eleven vratas (vows) for every individual and for appreciation, he gave the concept of constructive work for the people to work out and to consummate the above two aspects he demonstrated that Satyagraha is interrelated and inter-dependent. Without practicing one, the other is not possible. All put together, it leads to a holistic view of life making the man into a Mahatma. Now one would ask is there no system for the school of nonviolence at all? There can't be a system for system brings violence. But, any one with great care and attention may evolve a system which is time and context oriented in an appropriate way. It depends upon one's vision of the above three aspects.